TBVI is continuously working on the development of new vaccine candidates. rBCGΔzmp1 is a recombinant BCG developed by the University of Zürich. Its primary target is global boosting. On the basis of its attenuated profile, it also aims to safely replace BCG in the (HIV-exposed) new-borns. Proof of concept studies on immunogenicity, safety and protective efficacy were performed in mice, guinea pigs and cattle. Further studies are ongoing. MTBVAC, developed by the University of Zaragoza, Institut Pasteur and Biofabri, is a live attenuated Mtb strain currently in clinical development. Its primary target population is newborns and secondary adolescences. The safety and immunogenicity results of the Phase I trial conducted at the University of Lausanne as well as the Phase Ib trial in infants within the South African Tuberculosis Vaccine Initiative (SATVI) were satisfactory. The clinical Phase IIa in newborns will start in Q4 2018. VPM1002 is a live-attenuated, recombinant Bacille Calmette-Guérin vaccine (BCG), originating from the Max Planck Institute for Infection Biology. This new vaccine has been developed in the clinics by the Hannover-based Vakzine Projekt Management GmbH (VPM) through the phase IIa study. VPM has teamed up with Serum Institute of India Pvt. Ltd. (SIIPL) and together they are currently conducting a phase II trial in South Africa evaluating VPM1002 as a prime vaccine in HIV-exposed and HIV-unexposed infants. The subsequent pivotal phase III trial, funded by SIIPL and EDCTP, is currently in the preparation phase. Newborn infants are the primary target population as the ultimate goal is to replace the current BCG with VPM1002. Data from the first clinical trials have confirmed the pre-clinical data and showed that VPM1002 is at least as safe and immunogenic as BCG. In addition, a phase II/III trial has started in November 2017 in India to assess the potential of VPM1002 as a post-exposure vaccine in prevention of TB recurrence after successful anti-tuberculosis drug therapy. H64 is a protein fusion vaccine developed by Statens Serum Institut. H64 consists of six strongly expressed proteins. The fusion protein is highly immunogenic when administered in CAF01, an adjuvant that has recently demonstrated induction of CMI responses in humans. The primary target of the H64 vaccine is to supplement the BCG vaccine. Ongoing experiments within the TBVAC2020 consortium are investigating which epitopes are immunodominant during M.tb infection and if removal of the dominant epitopes will allow for exposure of cryptic/subdominant epitopes and improved protection. ChAdOx1.PPE15 is a recombinant, replication deficient chimpanzee adenovirus constructed in Oxford, expressing the mycobacterial PPE15 protein. This candidate is part of the overall UOXF TB vaccine programme to work towards a BCG booster vaccination regimen in adolescents and young adults. Four candidate antigens were identified and cloned into the simian adenoviral vector, ChAdOx1. In mouse experiments, ChAdOx1.PPE15 showed the most interesting results to further evaluate. Currently ChAdOx.PPE15, is being evaluated in guinea pigs to test whether protective efficacy of BCG can be improved in this more stringent model. CysVac2/Advax is a fusion protein vaccine developed by the The University of Sydney and Vaxine. The vaccine includes proteins designed to target both active and chronic infection with Mycobacterium tuberculosis. Preclinical experiments in mice demonstrate that the fusion protein affords strong protective efficacy against M. tuberculosis infection when combined with the novel polysaccharide adjuvant AdvaxC. AdvaxC has shown a good safety profile and induction of T and B cell responses in previous human vaccine trials. On-going preclinical experiments are examining the ability of the vaccine to protect in additional animal models (e.g guinea pigs) and define efficacy in post-exposure models, in order to strengthen the case for clinical development of the vaccine. As part of their TB vaccine programme, University of Oxford is developing an aerosol inhaled route of TB vaccine delivery. 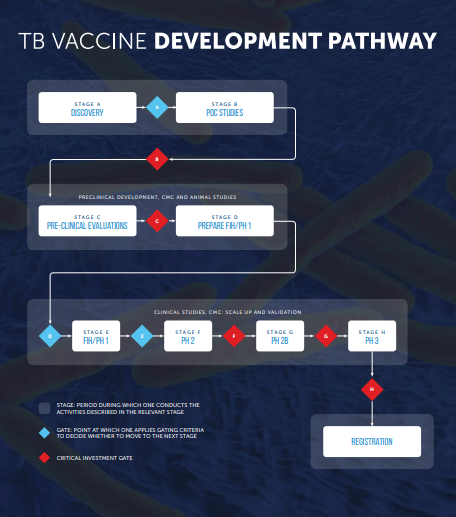 This route of administration of a TB vaccine could offer practical, tolerability and safety benefits over and above needle-based methods. This may be particularly important for developing countries. A second clinical trial phase I with aerosol MVA85A has just completed in Oxford, to further evaluate the effect of this route of immunisation on anti-vector immunity, and a third clinical trial evaluating safety of aerosol MVA85A in latently-infected healthy UK adults has just started enrolment. Transgene is developing therapeutic candidate vaccine against Mycobacterium tuberculosis. A range of MVA constructs expressing from 6-10 TB antigens covering all 3 phases of the infection (active, latency/dormancy, resuscitation) was generated. One lead MVA candidate expressing 10 antigens was selected in preclinical studies showing its immunogenicity in different mouse strains and its efficacy in two mouse post-exposure models. Transgene aims to bring the MVA lead candidate to the clinic to improve treatment of TB, in particular linked to DR (drug resistant) strains, and to prevent reactivation and/or re-infection in the adult DS (drug sensitive)/DR population, in particular from endemic countries. RUTI® is a non-live immunotherapeutic agent based on cell wall fragmented Mycobacterium tuberculosis. RUTI® is intended as a therapeutic vaccine to be used in conjunction with the standard antibiotic treatment. Its target is to improve the cure rate and to reduce the relapse incidence focusing mainly on Multi Drug resistant TB (MDR-TB). A Phase II clinical trial in LTBI adults has been successfully completed. Currently a Phase IIa clinical trial in patients with MDR-TB is being performed and the preparation for a subsequent Phase IIb/III trial is underway. TBVI provides technical support for product and clinical development to TB vaccine researchers and developers. For more information, please contact Daniëlle Roordink.